If your pleasure is the action-driven thriller with cardboard characters, skip this review. 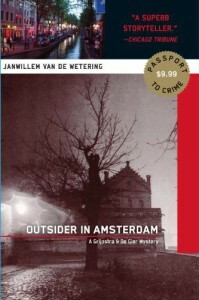 Outsider in Amsterdam, the first in the 'Grijpstra and De Gier' series, is based on the characters of Adjutant Henk Grijpstra, weary from life with oppressing wife and children, and Sergeant Rinus De Gier, a young bachelor attached only to Oliver, his psychotic tomcat. Although, like most 'mysteries', there is a murder to solve—the apparent suicide of the leader of a small semi-religious sect—the case takes second place to interaction between the characters. Often an interrogation between the detectives and their suspects wanders into philosophical or ethical ruminations. If the pace seems lackluster—there are perhaps three action sequences in the entire novel—the wonderful dialogue and interesting characters that fill this novel will remain in mind long after the last page is turned. For those who are interested in the plot: Piet Verboom is found hanging from a rafter on the topfloor of the building that houses his Hindist Society. What looks like a suicide becomes a homicide when Verboom turns out to be heavily drugged with the medication of his demented mother. And with a small fortune of cash missing there's a motive. The missing money turns out to be only one of many motives: drugs are found in the miso soup, one of the staff is pregnant with Verboom's child, and Verboom's ex-wife might have her own axe to grind. This excellent mystery has also been filmed in 1979 with a young Rutger Hauer [Blade Runner] as Rinus De Gier. Although the film is only available with atrocious dubbed voices, it's still a diamond in the rough.